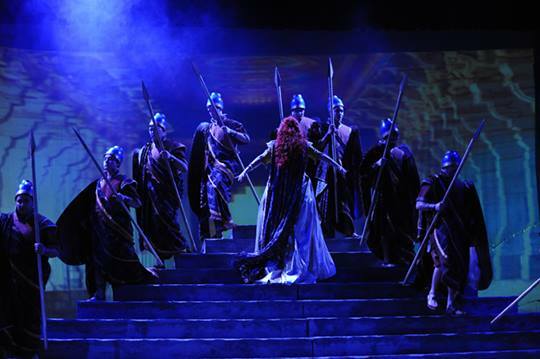 The Sunday Times of Malta of the 23 November carried another glowing review following the production of Nabucco on 23 and 25 October 2013. The piece by Albert G Storace is being reproduced below. Verdi’s earliest great success, Nabucco, remains a perennial favourite and as fresh as ever. 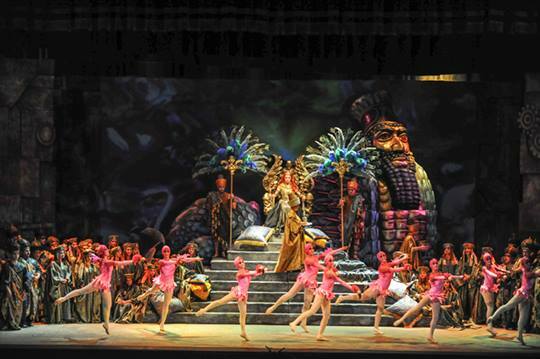 The lush music and exotic setting, the well-defined characters and the superb choruses see to that. Gozo’s Astra Opera House put on a two-night production worthy of any opera house anywhere. In fact this is what one expects and gets from both Gozo’s opera houses and which has foreign visitors in astounding disbelief…until they sample these productions.Artistic director Enrico Stinchelli’s interpretation of this gem was to say the least, lavish. Manuel Grima and George Farrugia’s costumes were superb from the plain garb of the Hebrews to the colourful attire of principals and Babylonian civilians while Joseph Cauchi’s beautiful sets added to the heady mix. Yet there were a few “buts” in the first of the two performances under review here. Visual projections add to create atmosphere, but this time things were a little bit over the top. This could be a matter of opinion and taste but what is to me a definite” no-no” is to have the clashing sound of lightning and rumble of thunder interfering with the music as happened in the overture. Presumably all agree that what the composer writes and wants is sacrosanct. Often an independent concert piece, this was splendidly performed by the Malta Philharmonic under the experienced baton of Joseph Vella. Indeed, it could be said right from the start that the MPO performed very well and direction obtained all the nuances of the music and required balance. Nabucco is also distinguished for its many lovely choruses, indeed it is almost an opera for the chorus and as such not surpassed by any of Verdi’s other operas. The Astra Opera Chorus, very ably trained by Maria Frendo was crisp and on cue and on best cohesive form ever. The chorus was well-handled and directed in the frequent crowd scenes and of course one of the longest applauses of the evening came in the wake of the immortal Va’ pensiero which held the audience in such magical thrall that the choir was allowed to project to the full that last, very long sustained note. This stood out because unfortunately some impatient elements in the audience had this irritating habit of applauding before the last note sounded. Verdi scatters beautiful melodies and recurring motifs all over the score and these are taken up by the principal characters as well as the chorus. The characters dish them out lavishly especially in the solo and ensemble pieces. The principal characters were well-interpreted by what was virtually a star-studded cast with a budding star gaining more and more exposure in local opera. The latter refers to tenor Cliff Zammit Stevens as Ismael who did very well. Astra first engaged him in minor roles which moved on to his main second principal as his acclaimed Cassio last year in Otello. His Ismael came across well although one wished a dash more ardour in the scenes with Fenena. The latter role was taken by mezzo-soprano Olga Sliepnova, whose Emilia in that same Otello revealed her as one worthy of a bigger role and she got it this time. Lesser but well-performed roles were those of soprano Dorienne Portelli as a Priestess, baritone Louis Andrew Cassar as the High Priest of Baal and tenor Mario Portelli as Nabucco’s faithful retainer Abdallo.Bass Carlo Colombara’s Zaccaria, the High Priest of the Hebrews initially suffered in the upper reaches but eventually settled down superbly. This leaves the two remaining lead characters in the opera. First, there is title role taken by baritone Piero Terranova. It was a mistake to have him appear too high up and too far back on the stage when he makes his first entrance as conqueror. He sounded too weak but when Nabucco arrogantly declares himself “god”, Divine wrath strikes him down. That knocking about brought out his lovely, rich, mellow real Verdian baritone because he was in a position where he could project his voice to the full. He never looked back after that. His confrontation with the over-ambitious Abigaille was memorable and so was his lost, wandering, humiliated monarch and later conversion following his ardent Dio degli ebrei, Dio di Giuda! The role of Abigaille could be a voice-killer. It requires a vast vocal range, as powerful as it could be gentle. Silvia Dalla Benetta has the incredible voice and temperament to carry off the role of this vicious, cruel and supremely ambitious woman who stoops at nothing to usurp her father’s throne. Having her cast as a flaming redhead made her a rather unlikely Babylonian, yet this added dash to the character. She covered the wide gamut required of her and even if at times her topmost notes sounded a bit shrill they were sustained and her shift to the lower reaches was pretty astounding. She acted and sang the role so well that while disliking Abigaille for the cruel schemer she was, one felt pity for her when she got her just desserts. This and other elements together made of this production another memorable Astra operatic experience.